Where do we go now? We’ve reached the end of the story for Jesus. He died, was buried and has been resurrected. It’s the end of the road for his disciples, right? We can go home too. Jesus’s resurrection is the high point of our liturgy. “Christ is risen; he is risen indeed.” Our work here is done, yes? No and not so fast. After the resurrection, we are commissioned with the disciples. Jesus says to them, “All authority in heaven and on earth has been given to me. Go therefore and make disciples of all nations, baptizing them in the name of the Father and of the Son and of the Holy Spirit, and teaching them to obey everything that I have commanded you. And remember, I am with you always, to the end of the age” (Matthew 28.18-20, NRSV). Jesus tells the disciples to get moving. His work is finished but ours has only begun. Hands extended on a cross are now shooing us out the door. “Go out into the world and talk to strangers. Spread out and spread the word. Make students of my teachings,” Jesus says. He adds, “And you have all that you need: God above you, the Holy Spirit within you and me walking with you every step of the way. And don’t you worry; I’m never leaving you again.” We will not lose him again; we will not come this way, pass by his tomb in sorrow again. The worst is behind us and the kingdom of God is before us. Life after Easter looks like that of the early Church as recorded in the book of Acts. As the wind of the Holy Spirit blows, we, like Peter, John and the other disciples, walk in the authority of Jesus’s name. Preaching, teaching, baptizing, serving, our hands are extended. Jesus is and likewise, we are just getting started. I am often discouraged by the nature of our fellowship, by the obvious hypocrisy of the Church in North America. We claim to be the body of Christ while socially coloring in his hands and feet so that he is one of us– and not them. Black Jesus. White Christ. Emmanuel, God is with us– and not them. How the Church can claim to represent the spiritual reality of “God with us” when we have allowed race to come between us is dumbfounding. How can we be siblings according to our faith, one family under God and base our fellowship on the social coloring of flesh– instead of Christ’s cross? No need to make the claim of being an alternative community because there is more of the same behind church doors. “This church is my church. This church is your church.” We do not worship well together. I lament the theologies that support the doctrine of race and its progeny. I am saddened by the calculated and polite distance between churches of different cultures and ethnicities. I am surprised by our level of acceptance and comfort with this social arrangement. Because this is not what God wanted. This is not God’s kingdom on earth but our own racial empire. Made in America. And where is the authentic conversation about the social construct of race and its progeny? Where is the vulnerability and the willingness to show our wounds, to share what we have witnessed and to wonder aloud, “Why are we so divided as Christians? Why can’t we come together? Why aren’t we in this faith together?” These questions bear repeating until we have answered them with transformed lives. “Our membership in the church is a corollary of our faith in Christ. We can no more be a Christian and have nothing to do with the church than we can be a person and not be in a family. Peterson reminds me that we have been saved together, that one culture does not have an inside track on salvation, that God made no back room deal that allowed one people group to be more or less saved, less loved, less blessed than the other. Because there is but one cross, one Christ, one blessed sacrifice, one reunion around one throne, one banquet table with seats for us all. God undivided but shared with us all so that we could be saved together. When I was a child, some persons in our neighborhood called my dad “dirty white boy.” It was not said to be mean but was stated as a matter of fact. In my father’s ignorance, he accepted it as a nickname. He did not know his father and perhaps in search of a community in which to belong, this seemed like a small price to pay for admission. Nevertheless, being a member of both cultures allowed him to represent the privilege of whiteness while accepting the camaraderie through oppression offered in blackness. He was “the Man” and yet, one of us, blessed but cursed a little, not black but maybe off white. His mother, Mary, was African American and socially color black, which rendered him socially impure, unclean, mixed. He was a dirty white, a dingy white, a stained white and thus, not quite right. People in our community did not know how to handle him so they addressed one side of him but never both at the same time. They did not know what to make of what he represented. The product of two opposing sides, my dad was both in and out. So, they both fought against and stood with him—all at the same time. He never talked about his father and consequently, never talked about his whiteness. He started drinking at fifteen years old and never stopped. Perhaps, the words that were attempting to find a voice were too much for him and the alcohol was too much for them. They could not swim and with blurry vision, they wouldn’t have made it far had they survived the daily attempted drowning. Recently, when I asked him about his dad and my grandfather, he still had no desire to know him— not even his name. Maybe he would have felt a pull if he acknowledged this side of him. Perhaps, he feared it would tear him apart since he was not completely one or the other. To date, he has never met his father and in my observation, has never seen himself as anyone other than the dirty white boy. Like my dad’s nickname, responses to race are a mixture. Some are made public, chanted in the streets, a chorus of discontent while others are shared in polite company and through inappropriate jokes. Race is talked about at the kitchen table, while sitting on the couch, in the car, in a barber or salon chair. It is also hushed, the reality hidden and ignored all together. We don’t want to talk about race because race has never been the right word for us. Instead, race is a misinterpretation of our humanity. It is also never the right time or place because race is too personal, too painful, too much to talk about at one time. This is all true; race is the elephant that struts into the room and sits on our chests. It has a reservation with us. It’s always on the menu, an American special and most days, we have no appetite for it. Race has been with America since its inception. They grew up and played together. In fact, race is more American—though less appetizing— than apple pie. We bring it out on holidays like this one but it is the painful familiar. It hurts but it’s all we know. So, we talk about King’s dream rather than begin the daring task of counting raised hands and assigning work to would- be ministers of reconciliation. We do community service projects but never leave our community. But, Thomas Merton said, “A faith that is afraid of other people is no faith at all.” Still, whether due to fear, ignorance or pain, we believe that it is easier to live according to society’s color- codes. We would rather be beige/ black/ brown/ red/ yellow/ white. Unsure of what it really means to belong, this seems like a small price to pay for admission. While the Galatians were guilty of observing days and times,[i] we are guilty of observing people. We look for certain kinds of people. They have to be our people, one of us and not them, in order to be the right people. And this scrutiny is not limited to the social invention of race but I hear it in conversations involving age, experience and gender: “You’re too young or too old. We were here first. Or, we’ve been here longer. We need the right man for the job.” All of it lines us up, orders us around and positions us as first and last. So, the separation is inevitable and even makes us comfortable— young versus old, present versus future, man versus woman. Though Paul is writing to the Galatians who had fallen into mixing faith and works, he finds an audience with us as we mix faith and the works of our skin, our culture and country. We believe in social sanctification, in racial regeneration. We believe that our race will determine our righteousness. It is an assumption that we can and must add to Christ’s cross, that something is lacking in his sacrifice— and that the color of our skin satisfies it. It is a mixed religion as it were. If we are seeking human approval, then it is the good news of our bodies— not Christ’s. It is righteousness through our appearance in the earth not God’s appearance in Christ. But, like Paul, we must say, “The life I now live in the flesh I live by faith in the Son of God.”[iii] Consequently, our belief in the sanctification of skin is “another gospel.”[iv] To put faith in our epidermis or any one else’s is idolatry. No, these meanings, our prejudices and stereotypes should have been drowned in the waters of baptism. We are no longer clothed in skin but with Christ. We wear him. We exhibit. We show him to the world. This is how we are one. We are not one human race but one blessed, broken and shared Body, which is Christ’s— no longer Jew or Greek, slave or free, male or female or dirty white boy. But, we are one in Christ Jesus and have always belonged with God, an admission promised and for which we could never pay for. [i] Because there is only the Lord’s Day and all of time belongs to the Eternal God. These are the words of well- known pastor and translator of The Message, Rev. Eugene Peterson. It is a fair warning though not considered frequently enough. I use to pride myself on the number of words that I could type in a minute. Who knows what the count is for many of us these days with tweets, blogs and minute- by- minute Facebook updates. There is no end to our words. Isn’t it ironic that we seem to be saying more than ever but that our communication is greatly reduced and has not improved in meaning or depth? In fact, we are not saying much that is new; instead, we are finding new says to say the same old, same old. In some cases, this is good; with regard to relationships across cultures and matters of race, it has been tongue- tying. Now more than ever, I am becoming increasingly aware that our world is made up of words. It is an old and obvious truth, recorded in the opening chapters of the book of Genesis. It is the record of the speaking God, who used words to create, who left unsaid nothing beautiful or majestic. I have read it numerous times but my consciousness was dim to the fullness of this reality. Of course, as Christians, we believe in the God who is the Word made flesh (John 1.14). In some measured sense, I understand this but certainly not fully intellectually and theologically. 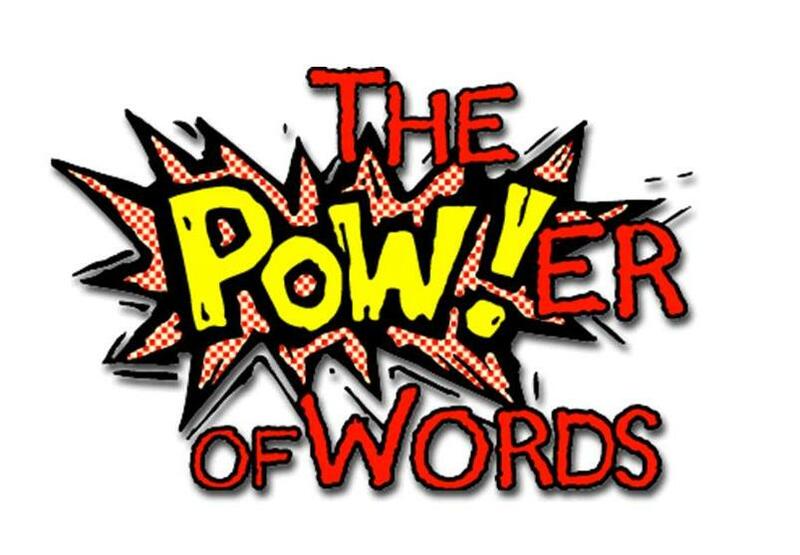 I believe that we are people who live by words and that we are walking words, that our names have power and can purpose our lives for good or ill. And with the recurrent violence that everyone is talking about, the power of the words we use is increasingly more evident. Thanks to social media, we share what we feel and how we are doing at lightning speed. We have so much to say about ourselves and others. I wonder what this says about the value of our words when we don’t keep some of them to ourselves or save some for later. To be sure, words are powerful. They have caused wars, deaths incalculable and tragedies unthinkable. We learn more quickly of embarrassing moments and the missteps of those who wish that there was a rock that they could hide under that didn’t have Wi-Fi. What is the matter when we continue to speak words that hurt us and clearer still, that silence us and keep us from seeing ourselves? What is wrong with our speaking when we lose our voice and become a puppet of the very words we speak, when our tongue becomes the strings pulled? I believe this to be so when it comes to race. We started using these words hundreds of years ago against others and for our benefit. Now, they don’t benefit any of us. We have lost the meaning of ourselves with their use. So, what do we say now? What do we do now that we are employed by race, now that race has our tongue? I say we quit, that we stop speaking of our humanity on these terms. What say you?